Synopsis: A newly born baby’s body is washed up on a deserted beach, sparking a discovery that shocks and stuns a rural community. On the same night eighty kilometres away, a young mother gives birth to a stillborn baby. 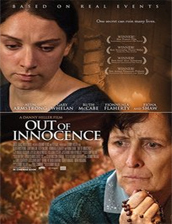 Set at a time of disharmony for women in Ireland, and inspired by the Kerry Babies Case, Out of Innocence tells of a case which rocked the nation and has repercussions to this day.